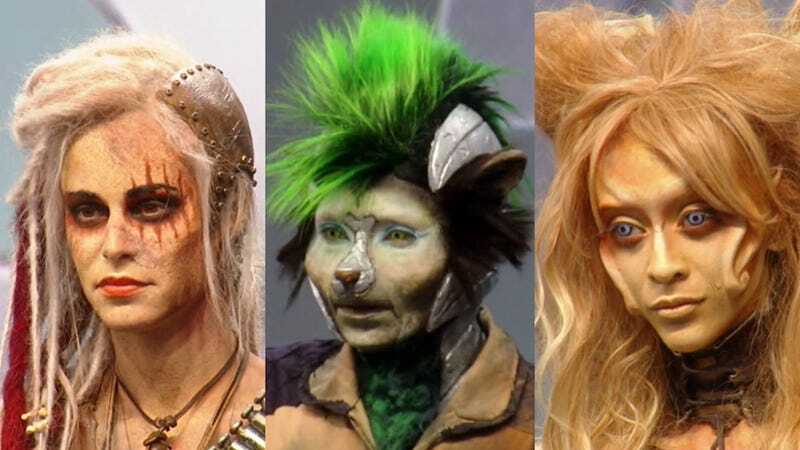 The three finalists face their final challenge - creating a team of four characters who could star in their own science fiction, fantasy or post-apocalyptic movie franchise. Which contestant makes the most fantastic quartet and wins Face Off's eighth season? Results ahead. All the eliminated contestants from earlier in the season come back and are divvied up to give each finalist four team mates. Because of the scope of the challenge the finalists have an extra day to work. The challenge is not just about having a strong concept but keeping a team on track to make that vision into reality (something the judges have some experience with ). The finalists choose their genres randomly but the choices suited each one. Darla and Logan got ones that played to their creative strengths while Emily came up with a good concept for her choice. The finished characters are displayed at Universal Studios Hollywood for an audience and the judges to view and vote on. Emily's genre is Post-Apocalyptic. Her movie, Paradise Reckoning, re-imagines The Wizard of Oz with mutants. I didn't really see the Oz without it being pointed out (like the red shoes) but it is still another good effort by Emily. She got a little bogged down with the glass character but still got her team to produce what she wanted. Not bad at all for an eighteen year old. Logan has Science Fiction. His movie, The Fortress, features a team of escaped mutated lab animals (a certain uplifted raccoon would probably fit right in). Yes, his designs draw from some popular movies and shows but it works. His group of characters look the most like a cohesive team. I liked the punk skunk in particular. I'm partial to space opera so of the three movies The Fortress is the one I would definitely see in a theater. Darla draws Fantasy. Her movie, The Spirits of Eden, has four elemental spirits in the Garden of Eden after Adam and Eve are gone (the title is also a play on Darla's last name). Laura provides some good advice for the earth elemental that helps make it one of the standout characters. The Spirits of Eden is the audience favorite as well as mine (but it was a very close call with Logan's). The judges also give Darla top marks and she wins this season of Face Off. As coach, Laura shares top honors and a cash prize of her own. Darla wins the top prize but I have no doubt that Logan, Emily and some of the others can find work in the industry if they want. The finale is another chance for the previously eliminated contestants to show what they can do. For example, Stephanie had her work on Darla's wind faun praised by the judges which adds a strong entry to her portfolio of work. Face Off will return in July. Meanwhile you can see galleries of this week's designs, past works of the champions and previous seasons here.